Nan McDonald was just 16 when she was first bitten by the bug for performing. As a young girl, she fell in love with singing, acting and dancing, and she spent the next 30 years treading the boards, performing in leading lady roles. 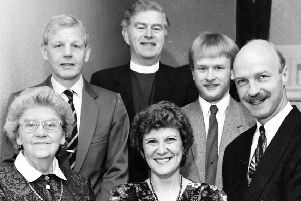 After retiring from the stage, she nurtured the talents of countless children through running Linlithgow Amateur Musical Productions (LAMP) and Children’s Theatre Bo’ness, alongside husband Bill. And last week, her 60-year commitment to amateur dramatics both on and off the stage was recognised with a presentation at Bo’ness Town Hall. She said: “I think I’m like Frank Sinatra; I’ve had too many comebacks. “Just when I think it’s time to stop, I get going again. It was Nan’s uncle, a organist at Falkirk Baptist Church, who first spotted her talent for singing when she was nine years old. He encouraged Nan’s mother to take her to singing lessons, which she remembers “loving” as a young girl. As a teenager, she joined Falkirk Bohemians, performing her first leading role in her early 20s, but later joined Bathgate Operatic Society. By that time, she had performed plenty of leading roles, with her favourites including Dolly in Hello Dolly. In 1985, the McDonalds became heavily involved in LAMP before leaving to start Children’s Theatre Bo’ness in 2000. Nan said: “Bo’ness is very much a musical area, and we just wanted to see if children would be interested in joining. The theatre has produced a show every year since, with director Nan being recognised after Rapunzel last week.